Named widgets simplify input of values by providing a value list or range. Value input is normally done via mouseclicks, key input is optional. In Glade some properties of spinbutton widgets can be set like the minimum/maximum/default value. It is required to tie a adjustment widget to the spinbutton. To do so select "General > Spin Button Attributes > Adjustment" and assign or create an adjustment. Looking at the example file the two spinbuttons represent month and year dates. The month spinbutton is set to be circular, the minimum value follows after passing the maximum value. This act emits the wrapped signal which is assigned to then adjust the year date of the second spinbutton. The list items are stored in a ListStore or TreeStore element that can hold data sets instead of a plain list. These data stores are accessible to different widgets (see the "List article"). Both widgets can include an optional entry widget which has to be activated in "General > Has Entry". By activating an internal GtkEntry widget is created. It is important to set "Common > Widget Flags > Can focus". The first ComboboxText widget in the exampe does not possess an entry field, the user can only select an item from the list. In both widgets the changed signal is assigned to retrieve the selection. The value of a spinbutton can be easily retrieved and set via get_value and set_value. In the example the values for the month and year date are set with the current dates. The on_spin_m_wrapped function changes the year date up or down according to the value set in month date. Combobox lists can be extended by using the append function, p.e. You get the selected item by calling widget.set_active_text() which also passes the text of the optional text entry widget. CSS layout instructions are set in the source code. 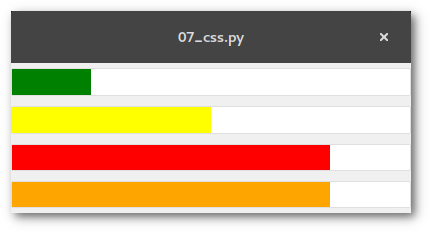 This example shows the usage of CSS in levelbars so 4 of them are created with Glade. that are stored in a string variable loaded by the Gtk.CssProvider() class. The values can be retrieved by the get_offset_value function or created/changed with the add_offset_value function. In the example the 4th levelbar has an additional offset marker between high and full that's why a value of 0.8 is not visualized as full like it is in the 3rd levelbar. The widget posseses an optional text field. It shows the progress in percent if the field content is not specified otherwise. For the add_offset_value function and colour schemes read the CSS article. The menu widget is part of the container widgets but itself needs an empty box to be placed in. There can be generated a standard menu that is easily edited after clicking on "Edit..." in a separate window. Creating shortcuts is also simple. In the "Edit" window a click on "Hierarchy > Properties > Accelerators" opens a dialogue in which a shortcut is assigned to a signal (regarding menu items you want to assign activate). 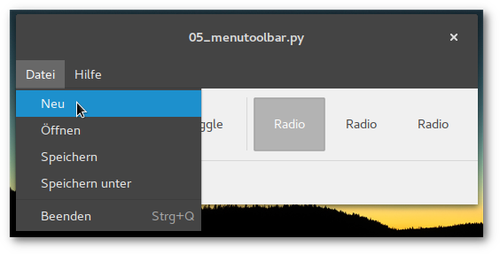 Toolbars contain different widgets like buttons, togglebuttons, radiobuttons oder (sub) menus. Generating and editing toolbars is analogue to menus. The purpose of statusbars is to show notifications or useful information. Messages are treated like a list, the statusbar widget provides the functions push and pop. If messages are exclusively shown "on top" the content_id can be a random number, like 0. All available GTK+ classes and their functions are documented in the Python GI API Reference >> Gtk 3.0 >> Classes. A switch is a widget that posseses two states, on and off. The current status can be retrieved by the state_set signal which is emitted on turning the switch on or off. Checkboxes are basically just togglebuttons therefore the toggled signal is allocated. The purpose of radiobuttons is the selection of _one_ list item. 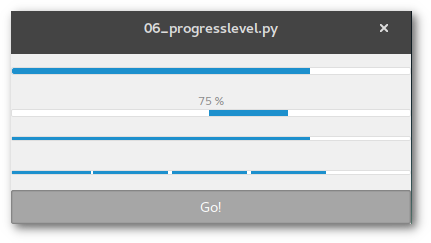 The widget is also a sub class of GtkToggleButton (allocate toggled signal). Every radio button is a member of a group. This is done via "General > Button Attributes > Group". There is one 'leading' radiobutton that are all other radiobuttons bound to. Given that checkboxes and radiobuttons are togglebuttons the status is retrieved by the widget.get_active() function. When the state_set signal is emitted on the switch a parameter is passed containing the status as boolean (True/False). There can be created different types of windows and dialogs (which are subclasses of windows). In this example the main window has two buttons. The first one opens an info dialog, the second one closes the main window and opens another window instead. Functions within the Handler() class of course can be assigned to multiple signals. So there are only 5 handler functions required in this example file. See also the sequel article to dialogues. Based on the first example some elements are added, a label, a button and a togglebutton. Any control or display widget requires a container. In this example a vertically arranged container box is created. Boxes can be extended, downsized, rearranged and contain further container widgets. Now the clicked and toggled signal are assigned to the button and togglebutton element. The label widget's purpose ist to display text so there is no signal assignment required. Glade provides a preview function to test if the correct reaction is triggered. On a button click the label widget should change the diplayed text randomly chosen from a given list. All Gtk.Builder elements can be addressed by the get_object function. The task of the togglebutton is to clear the label widget display and deactivate the button which can be reactivated on the next click. 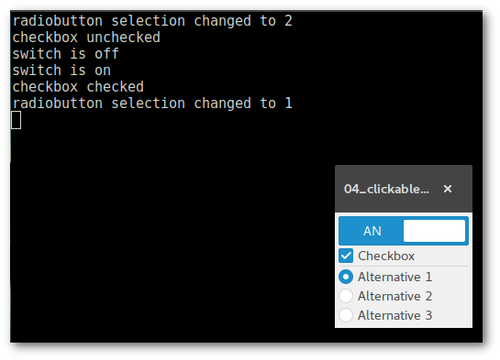 The status of togglebuttons can be retrieved by the get_active() function returning True or False. After launching Glade the application view is divided in 3 areas: window/widget selection on the left, the project view in the centre and a tree/property (including signal) view of project elements on the right. Now a window is created and an ID assigned to be able to address the element in the source code. To call functions from widgets they have to be connected to signals. Depending on the kind of graphical object signals can be emitted by clicking, marking, editing, switching etc. 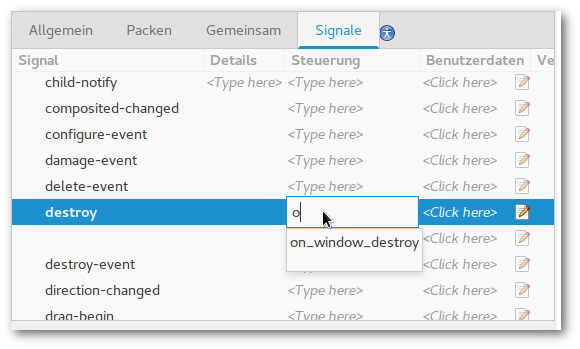 If the example window should be able to be closed on clicking the [X] button the signal destroy is required. The entry field to specify the function provides a convenient suggestion function to reduce key input following the pattern on_id_signal. Glade does not generate GTK+ source code but a XML formatted file accessible to GtkBuilder (see listing below). 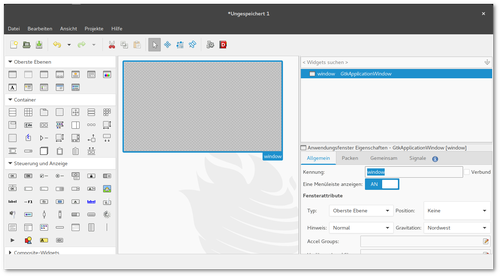 After initing Gtk.Builder() the Glade file(s) are added. It may be convenient to work with multiple files in one project. In this case you have to bear in mind that if there are elements with the same identifier name only the element of the last loaded file can be addressed by get_object(id). So this basic example script opens an empty window hat can be closed on clicking the close button. The definded window does not contain any elements like boxes, buttons, bars, menus and other widgets. Man versucht sie an schöne Orte zu führen, man produziert dabei Unmengen an Daten, die man dann in mehr oder weniger aufopferungsvoller Arbeit im Videoeditor möglichst ansehnlich zurecht schneidet. Wenn man ganz schlau sein möchte, schreibt man ein paar Skripte, die einem etwas Arbeit abnehmen. Und dann schreibt man eine kleine textbasierte UI, um das etwas abzurunden. Und dann erwischt man sich dabei, eine graphische Oberfläche zusammen zu zimmern.